Gone are the days of bulky and obtrusive wallets. When it comes to men’s wallets, thin is in.In the past few years, wallet designers have begun to create incredibly streamlined wallets to hold the essentials.For most guys, there’s nothing more irritating than carrying a bulky wallet. * It sticks out like a sore thumb and can actually cause back problems when sitting on them. 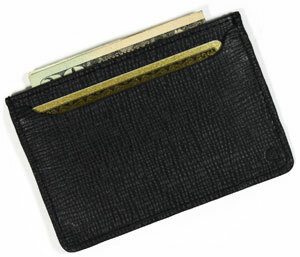 * Slimmer wallets give guys the functionality and style they need in a thinner design. Well first and foremost, there’s the comfort factor. 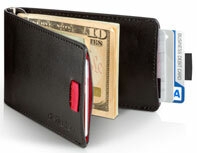 Slimmer wallets allow for more flexibility and comfort. Additionally, they tend to fit a bit more seamlessly into the back pocket. Fashion has changed in the last decade. Fitted pants and tight jeans have taken over, which make it nearly impossible to carry a bulky wallet. A thinner wallet will allow you to wear what you want while still carrying the essentials. Another great reason to go with a slim wallet is to get rid of clutter! In our technologically advanced world, we can have virtually everything contained in our smart phone. With a slim wallet, you can ditch all of the clutter and stay with the essentials. If you are in the market for a new wallet, there are a ton of great choices out there. This wallet uses simple technology in an incredibly fashionable and effective way. It is essentially composed of two crafted pieces of aircraft aluminum and a durable strap. The strap holds cards and cash securely between the aluminum plates. The plates themselves are RFID blocking, ensuring your precious information stays safe. When it comes to style, these aluminum plates are powder coated in array of colors. Guys can choose a color to coordinate with any outfit they may wear. It is a very versatile and effective option to stash away the essentials in a streamlined manner. Guys who want a traditional leather wallet will find this option perfect. It is designed to have that old world charm of sophisticated wallets, yet it is slim enough to accommodate the modern man. 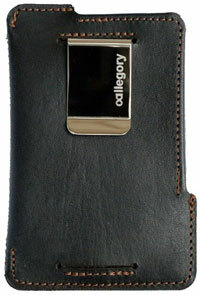 It is composed of vegetable tanned cow leather and comes in a few different neutral colors. There is two pockets for the most used cards and a pull out tab for any others you may need. There’s even some room for cash. You’ll have enough room to carry what you need in a wallet that has traditional design. Want to impress your friends at the next tailgate or poker game? Then you’ll want to get this unique streamlined wallet. It is composed of durable stainless steel and has a strong money clip. Guys can easily fit a few cards and a bit of cash in the clip. 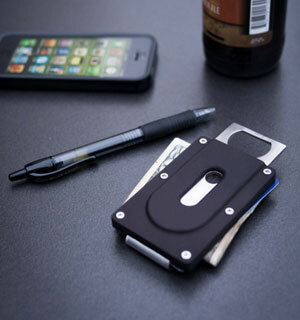 One of the biggest perks of this wallet is that it has the ultimate accessory built in, a bottle opener! You’ll always be ready to pop open a bottle and have fun. The opener is actually hidden within the construction of the wallet. All it takes is a simple slide to take it out for use. With a small profile that will reduce pocket bulk significantly, this wallet is a great option. With a thin profile that can easily be placed in a front packet, this wallet is great for eliminating bulk. It has two card slots and a cash pocket, giving guys the room they need to carry the important stuff. Up to three cards can be placed in each card slot for those who need a bit more room. However, the profile stays slim despite how many cards it contains. It has a great design that is both professional and sophisticated. Composed of high quality Saffiano leather, this wallet is made for the modern business man. This wallet boasts the title of thinnest wallet on Earth, and it certainly delivers on that promise. It is composed of an incredibly thin and strong leather. Its empty profile measures just under 5 millimeters thick. While it does expand to accommodate a few cards, the wallet stays quite slim. The unorthodox design gives guys easy access to their essentials while securing them into place. 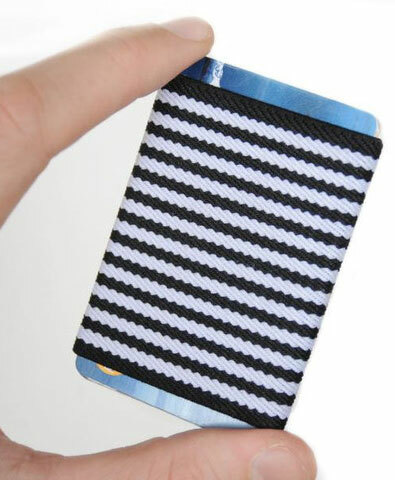 It contains RFID protection in each side to protect cards from identity thieves. 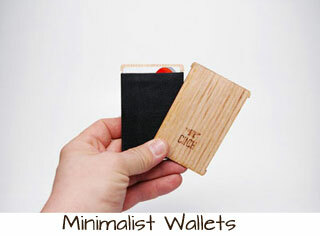 With its minimalist design, the wallet is a great option for any man. This wallet has a unique, yet familiar design. 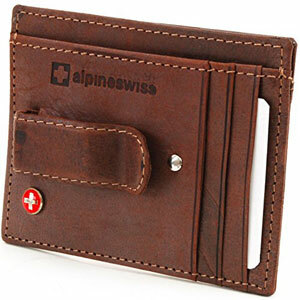 In fact, most would mistake this for a traditional wallet at first glance without viewing its profile. However, it contains a small profile with a unique design that keeps the wallet thin, despite its ability to hold up to 12 cards and cash. It has a unique pull tab to provide guys with access to their cards. It helps to keep the wallet slim while still providing accessibility. It also contains a money clip inside to keep cash at bay. Made of genuine leather and a pop of bright color, this wallet comes in Ninja Black and Cowboy Brown. 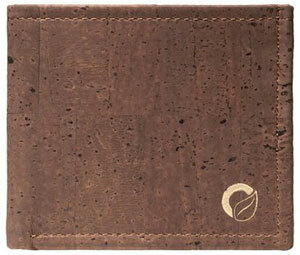 For an incredibly unique look and eco friendly design, you can go with this unique cork wallet. 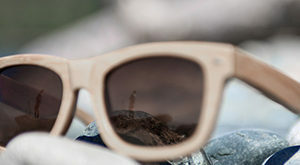 It is made from a distinctive cork fabric that comes in a variety of earthy tones. In fact, due to how the cork is harvested, no two wallets are alike. Made in Portugal, this slim wallet is perfect for vegan guys who want a unique wallet. With space for up to 8 cards and a number of cash bills, this wallet packs as much storage space as possible in a thin profile. While most don’t realize it, the makers of the iconic work boot has a whole line of men’s accessories. 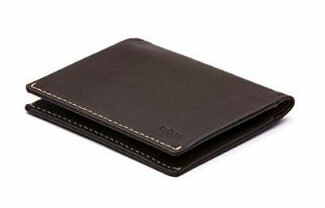 Their slim fold pass case wallet is a strong contender in the slim wallet market. Made from genuine leather, this wallet is rugged and durable. It has 3 card slots and a multi card pocket to keep your belongings safe, whether it is on the worksite or out on the town. The iconic brand has created a solid slim wallet that can withstand anything you throw at it. This wallet packs a lot of very useful features in a slim profile. Made from kangaroo leather, this wallet is stylish, yet rugged. 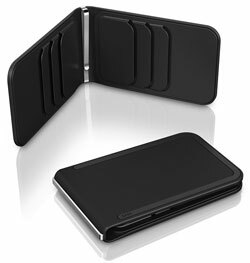 It has a unique corner load pocket to fit numerous cards and cash. It is easy to access, yet keeps everything secured. For even more storage space, the wallet has a money clip to hold extra cash. One of the coolest features is the quick swipe pocket. It holds up to two cards that can be taken out and used with one swift motion. It’s a great choice for guys who want something that is stylish, yet functional. This wallet is the epitome of modern accessories. Its futuristic, yet rugged, design is a statement piece. Guys will definitely stand out of the crowd when this wallet is brought out. The wallet is actually molded from Desmopan, which is water resistant polymer that is soft to the touch. It is incredibly durable, withstanding the elements and a lot of wear and tear. Inside, the wallet has 6 card holders and a stainless steel money clip. 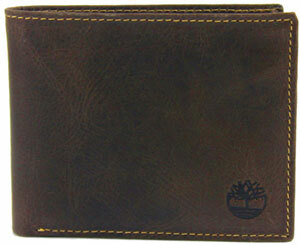 Overall the wallet has great style and functionality, making an ideal choice for any man. 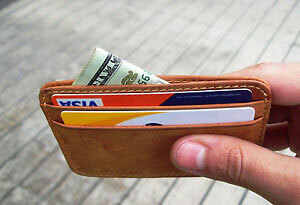 Those looking for a simple wallet at an affordable price can get a great deal on this wallet. It doesn’t have all of the bells and whistles that other wallets have, yet it is incredibly effective in cutting down pocket bulk. It has 3 card slots and a hidden cash pocket to stash only the essentials. Furthermore, the pockets contain RFID blocking technology, making it perfect for those who live in crowded cities where identity theft thrives. With an incredibly affordable price, this wallet is a great solution for guys who want to keep it simple. This wallet was designed with functionality it mind. It contains numerous pockets for storing credit cards while still keeping its thin profile. It also contains an oversized pocket for folded bills. 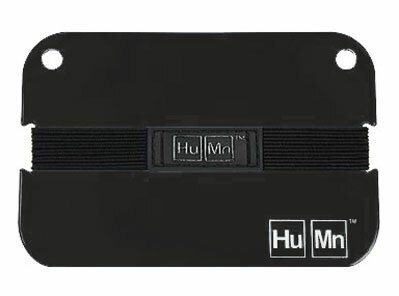 The spring clip money clip can also be used to hold cash or any additional items. The clear ID window also makes identification a cinch. Design wise, the wallet is a bit larger than the size of a traditional credit card, but is still small enough to fit into the front pocket. Made from genuine lamb skin leather, the wallet is durable and stylish. 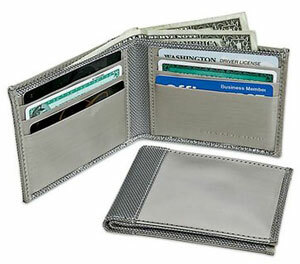 For the ultimate in modern style, guys can get a stainless steel wallet. These wallets will definitely turn heads, as they are made from steel fabric and woven steel threads. Not only does this make it look very unique, but it is also incredibly durable. With 6 card slots and 2 internal paper slots, this card can hold a lot while still keeping its thin profile. It is a great option for guys who want something a bit more unique. After all, who doesn’t want a manly and rugged steel wallet? This wallet got its start on the crowd funding website Kickstarter. It’s simple and streamlined design got the project funded very quickly. Manufactured from genuine leather and dyed canvas, the wallet is very simple in design. This simplicity is what makes it so great. In essence, the wallet is a simple sleeve that uses robust elastic to keep its contents inside. It can fit in any pocket, even a shirt pocket, for maximum flexibility. While it may not be the flashiest wallet on the market, it does a great job at keeping carried items to a minimum. For a more simplistic design, men can go with this Leatherboss wallet. It is made from high quality genuine leather to ensure that it is durable and stylish. The wallet is classic black in color to ensure that it is neutral and capable of coordinating with any outfit, be it a suit or casual wear. With 8 card slots and a cash slot, the wallet can hold a lot. However, it still keeps its slim frame. It has a very simple design that is not flashy, rather focusing the design efforts on keeping a slim profile. Overall, it’s a great option for keeping the essentials away without adding weight or bulk. Are 12 and 13 rfid protected?